High-speed Optoelectronic Modules using Vertical Cavity Surface Emitting Lasers (VCSEL) coupled to Multi Mode Fibers (MMF) are a performing and low-cost solution for 10 Gigabit Ethernet (10 GbE) in short-distance optical links. A complete model of the spatiotemporal behavior of multimode VCSELs, through static and dynamic response, noise, thermal effects, and its coupling to MMF has been investigated. Relative Intensity Noise shows modal dependence and can be affected by spatial filtering due to coupling and fiber propagation. Simulations permit to evaluate critical parameters, such as modulation formats, launching conditions, and operating temperature for global bandwidth and eye diagram optimization up to 10 Gb/s. 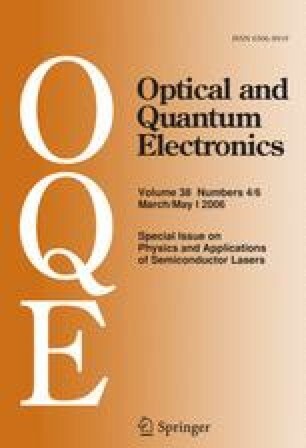 Simulation results are compared to measurements on prototype optoelectronic modules.